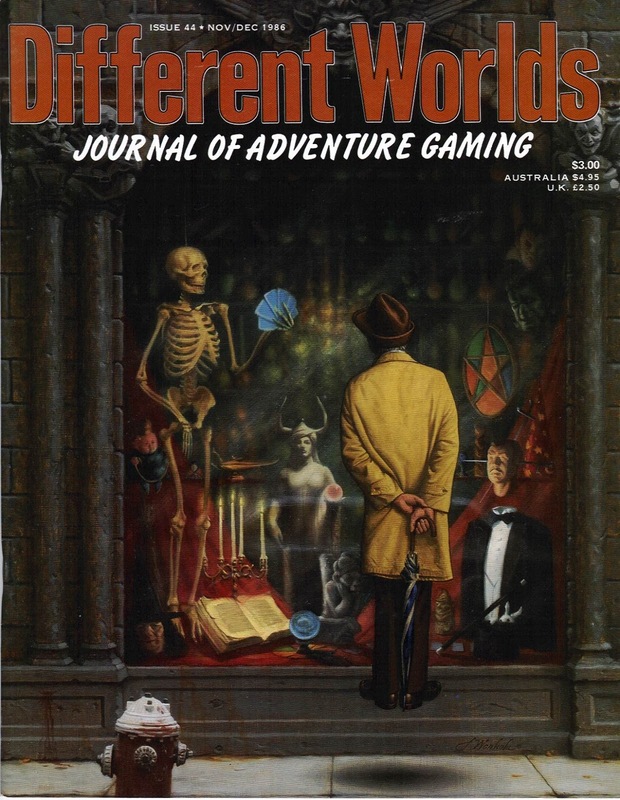 I'm a big fan of Tadashi Ehara's now defunct gaming magazine DIFFERENT WORLDS. Over its tenure, the magazine was published by a couple of companies including Chaosium and Sleuth Publications. 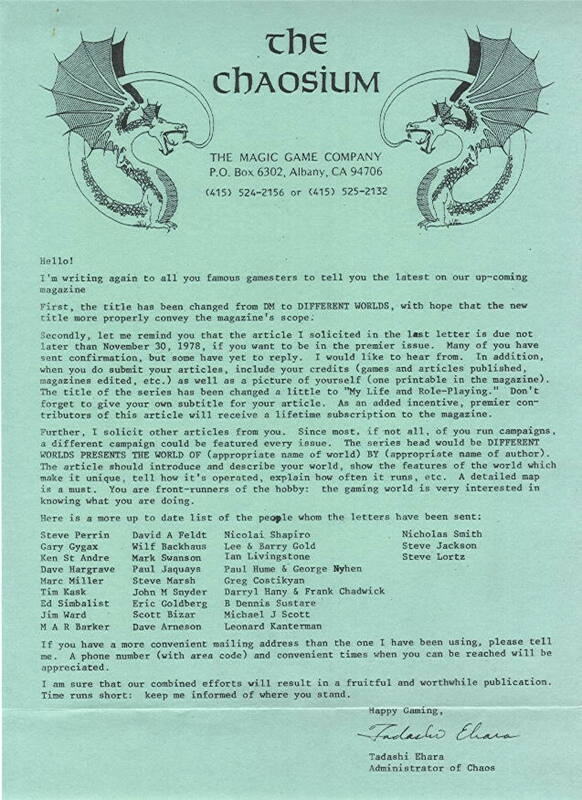 According to a pre-publication solicitation letter (available here), the magazine was originally slated to be entitled DM. The change was likely due to concerns over TSR's trademark of DM/Dungeon Master. Regardless of the reason for the change in title, I think that DIFFERENT WORLDS better suited the content of the magazine than DM ever would have. The magazine was a gem. Like Steve Jackson Games' magazine SPACE GAMER, Ehara's magazine covered the entire roleplaying game hobby. As I've written before, issue #23 of the magazine is maybe one of the most important magazines ever written about the origins of Superhero Roleplaying games. 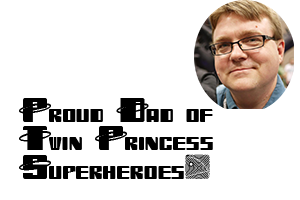 For those who want to understand the history of RPGs, DIFFERENT WORLDS, SPACE GAMER, and ALARUMS & EXCURSIONS are three of the most valuable resources that the aspiring historian can find. They really help to cut through a lot of the community gossip about a transitional era in the hobby. Speaking of Gossip, DIFFERENT WORLDS featured an excellent gossip column written by the pseudonymous Gigi D'arn (clearly a Gary Gygax/David Arneson reference). I've written speculation about the identity of this columnist before, and I'm still pretty sure that she was a real person and that the Chaosium staff added to her actual letters. There are just too many little tidbits of SoCal culture, which was booming at the time as an RPG hub, for me to believe otherwise. The column was filled with a great deal of speculation, some true, some pure fiction, and all fun to read. There are a couple of pieces of gossip/rumors in issue 44 that stand out and need attention. In fact, they are rumors that I'd like to hear more from the gaming community at large about, and I'll be asking around to see if there is any merit to them. First and foremost - actually quite shocking - really is a claim about ADVANCED DUNGEONS & DRAGONS. According to Gigi, "Rumour thinks TSR is unhappy with the ADVANCED DUNGEONS & DRAGONS game line and is considering dropping it. GARY GYGAX meanwhile is starting his own company, Infinity Games, in New Jersey. Will he take the license with him?" I wonder if this is true. 1985 saw the publication of UNEARTHED ARCANA and ORIENTAL ADVENTURES for the AD&D game, but the mid-80s was also the era of the publication of the Basic, Expert, Companion, Master, Immortals rules for D&D. It was a time when the D&D brand was divided among two sub-brands and a time when there was great potential that one brand was cannibalizing the other. From my experience, the D&D brand was putting out a lot of great material at this time. According to GROGNARDIA 1986 saw the release of a number of BECMI products and 1987 saw the production of the first Gazetteer products for the D&D brand - some of the best products ever released for D&D. If I were to guess, I'd say the rumor was true and that core rule book sales for AD&D had dropped. I would argue that this is why we saw a 2nd edition of AD&D released in 1989. An edition that may not have happened at all if not for the success of the Forgotten Realms Setting. My thought is that the Forgotten Realms setting, written for AD&D, was so successful that management decided to do a new edition of the game for increased sales. I'd like to know if this is correct or not though. The second interesting piece of gossip/rumors is that J.D. Webster, the creator of the Finieous Fingers cartoon strip, was a carrier fighter pilot. This is apparently true.